When R.I.C. 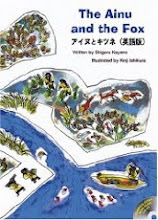 Publications published our translation of Shigeru Kayano's The Ainu and the Fox in 2006, they included a CD with every book. This is something they regularly do with their line of children's storybooks. The CD that came with The Ainu and the Fox contained a recording of the text plus selections of tonkori performances by Ainu musician Oki. In the process of exploring his Ainu roots, Oki revived the nearly extinct tonkori and developed his own interpretations of traditional Ainu tunes. He often fuses traditional Ainu music with that of other genres such as reggae and dub. For the CD that is due to accompany the Iyomante book we are thinking of going with Ainu music that is more starkly traditional. We have an idea of who we are going to ask, but it's not official yet. I'll blog the details when everything is settled. In the meantime, I wanted to tell you about MOSHIRI, an Eastern-Hokkaido based group that does a thrilling stage performance of Ainu dance and song. I was privileged to see this group perform in Sapporo many years ago, and was entranced by the drama of their performance. The men's dances, which are not often performed elsewhere, are especially intriguing. For the musical background to the dances, traditional instruments are supplemented by modern, non-traditional ones, so the music is fuller than it would be in basic, traditional Ainu tunes. MOSHIRI CDs can be ordered from their website (Japanese only) or purchased at their concerts (which are few and far between). Otherwise you have to travel to Lake Kussharo in eastern Hokkaido where the leader of MOSHIRI and his clan operate the Marukibune inn with regular stage performances for tourists. With the final revision of my translation of Iyomante: meguru inochi no okurimo (Iyomante: the gift of the cycle of life) safely in the publisher's hands, I let myself relax and unwind for a few days, knowing full well that the lull would not last long. My team members and I had made a list of possible English titles, our first choice being "Iyomante: the Ainu and the Bear." Not very catchy, I admit, but we wanted to retain the Ainu word for the bear-sending ceremony, and also make it fit with our previously published translation, The Ainu and the Fox. The proposed title had already been cleared with the original author, and the illustrator had agreed to draw a new cover illustration that prominently featured a bear (as the original cover was deemed too subtle for English readers). Sure enough, I received a call late last night from our team leader saying that the publisher was advising us to change our title. "Potential buyers will glaze over at the foreign word in the title and pass the book by," he had said. He would know. He's been successfully marketing English translations of Japanese storybooks for a long time. 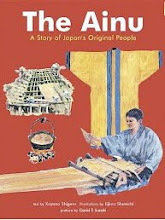 The publisher suggested just plain The Ainu and the Bear. The problem, from our point of view, was that Iyomante was not the simple children's-story-with-a-message that The Ainu and the Fox had been. While Iyomante imitates the yukar style, it isn't actually one of the stories in the Ainu oral tradition designed to be chanted by the tribal storyteller. It is the work of a modern writer for the purpose of informing modern readers about the bear-sending ceremony and the cultural values represented in that controversial, and frequently misunderstood, tradition. 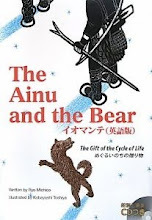 We chewed on the problem for a while, and finally came up with a compromise title: The Ainu and the Bear (in large letters) subtitled with the gift of the cycle of life (in small letters). Whether the publisher will accept this compromise remains to be seen. 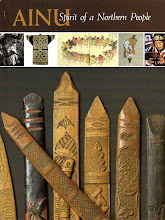 The Ainu Association of Hokkaido, an organization of Hokkaido-based Ainu, has an English site that offers information on the history and social conditions of the Ainu, as well as a summary of laws pertaining to the Ainu and an outline of the activities of the association, which aims "to improve the social status of Ainu people and to develop, transmit and preserve Ainu culture in order to establish the dignity of the Ainu people." 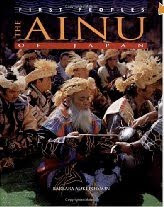 The Foundation for Research and Promotion of Ainu Culture, which was established by the Japanese government in 1997, also has an English site that explains the history of the Foundation's establishment and the many FRPAC projects conceived to promote and preserve the Ainu language and culture. For those who will be in the Portland, WA area this month, it may be worth your while to check out “Parallel Worlds: Art of the Ainu of Hokkaido and Native Americans of the Pacific Northwest,” which is being held in honor of Portland’s 50-year, sister city association with Sapporo, Hokkaido’s largest city. “Parallel Worlds” will be in place in the Pavilion at the Portland Japanese Garden from June 6-28 (2009) and includes a series of weaving demonstrations, lectures, dance and storytelling. Masamichi Nitani, of both Sapporo and Portland, is an Ainu woodcarver who will give carving demonstrations on various dates, including June 21, Father’s Day. For a complete schedule of events, go to www.japanesegarden.com. "Far to the east, north of the Mixed Eastern Azirian Yellow Japanese, live the Ainu. The Ainu are the last remnants of the Jomon people, driven north by the ancestors of the Japanese when they invaded from southern Korea. Once considered White, the Ainu are now known to belong to their own race. Having just a few thousand members, the Ainu are the smallest of Ærth’s races."